As show week continues – Millbrook Beds is very proud to announce an extra special new partnership with English Fine Cottons. Increasingly conscious of the devastating environmental impact of mass cotton production on communities and landscapes abroad, we took a decision. We decided we wanted to continue to do everything we can to make our beds beautiful, from the inside out. 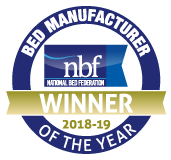 By partnering with English Fine Cottons, Millbrook Beds is the only British bed manufacturer making a commitment to use only UK sourced and processed cotton. Putting our ethics first on this occasion was made even easier when we saw the luxurious quality and beauty of their product, which is bringing cotton production back to its spiritual home in the North West of England.